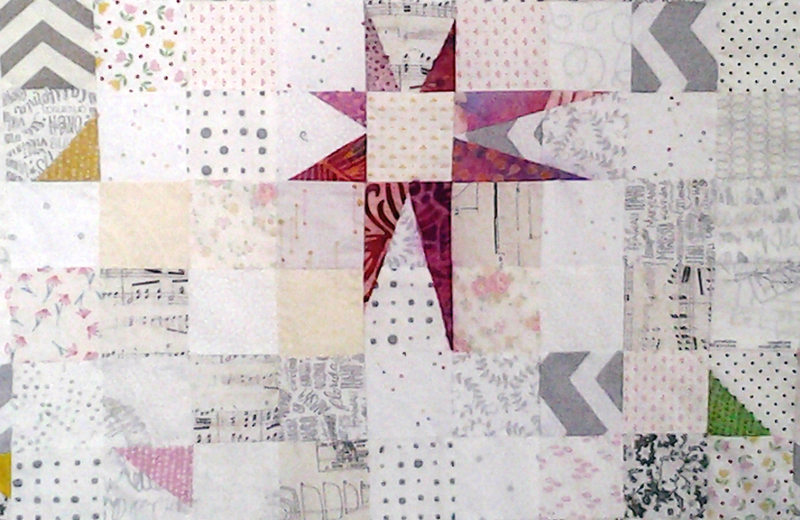 My latest infatuation is Low Volume Quilts and what better way to add some pizazz than with some Wonky Corners & Stars! 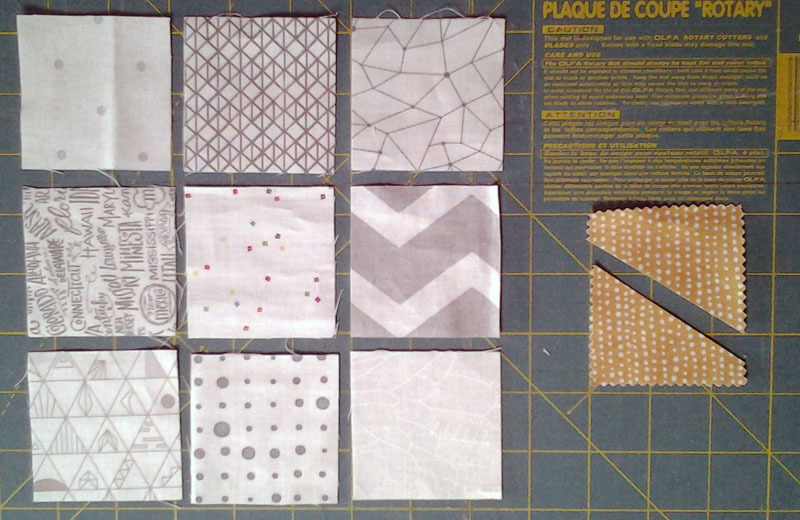 This Wonky Corners Quilt Block Tutorial is an easy method to use scraps in imaginative design applications. You can create pops of color to enhance any block and give it that edge to set it apart from the rest. What makes wonky corners so wonderful is that there are no right or wrong corners. There is no precise measurement required. Your creative nature sets the guidelines and then just have fun from there. 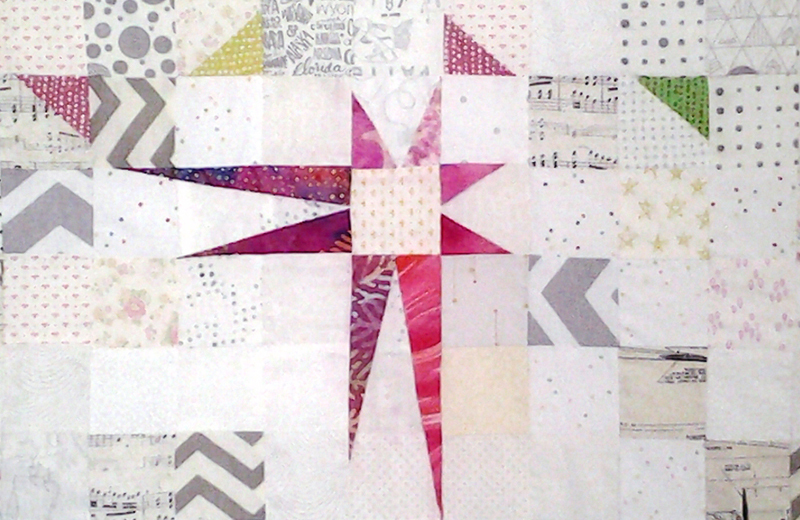 This adorable Low Volume Wonky Star baby quilt is a fun project. The wonky corners look like confetti sprinkled across the quilt top. It’s also brightened up by the wonky stars which make the colorful wonky corners jump right out at you. This pattern makes a wonderful baby quilt. This is my third low volume quilt. I still have enough cut fabric to make at least one more. Now I just need to decide on which pattern I want to make. Since these first three are all very subdued, the next one should pack more of a punch. I think I may have some batiks that will be perfect for number four. 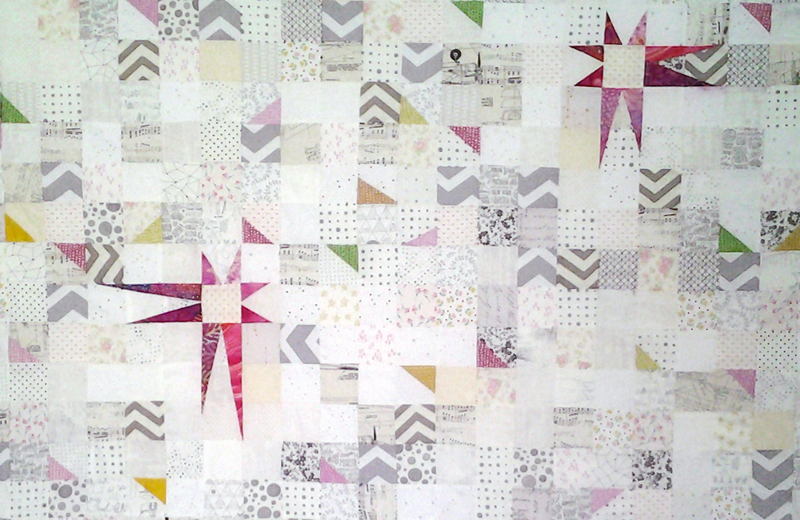 This Wonky Corners & Stars Baby Quilt is made with 9-patch blocks. There are 7 blocks across and 8 blocks from top to bottom. The Wonky Star blocks are made 6 squares wide by 6 squares high. Once the wonky star was made, I added extra rows to the outside of the block until it was the right size. Otherwise, the wonky star blocks wouldn’t line up with the other 9-patch blocks which are each 3 squares by 3 squares. 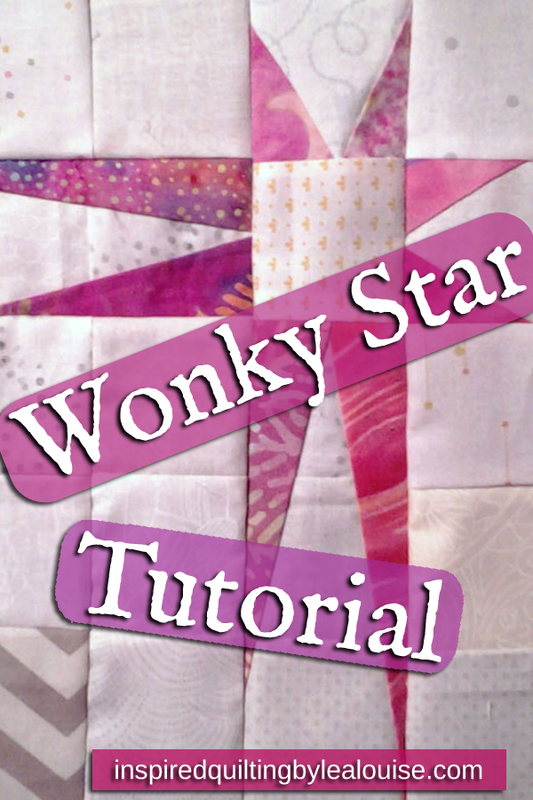 This Wonky Corners Quilt Block Tutorial shows you how to use random pieced corners to add dimension, movement and contrast within your quilt top. 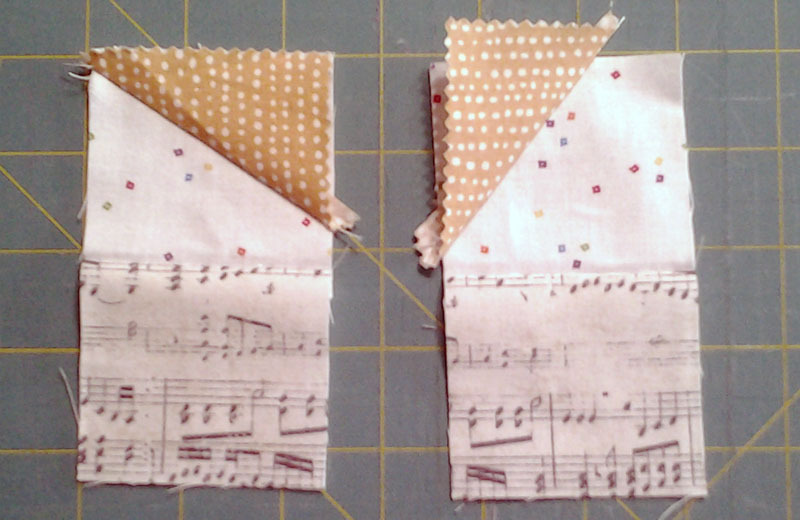 Also try using bits of border fabric as corners to tie your quilt design together. 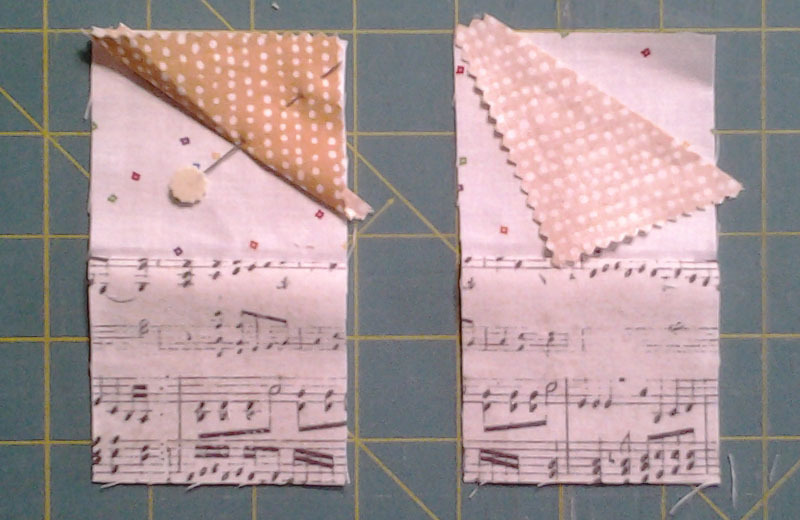 Since my squares are a small 2 1/2″, the triangles used can easily be pulled out of the scrap pile. 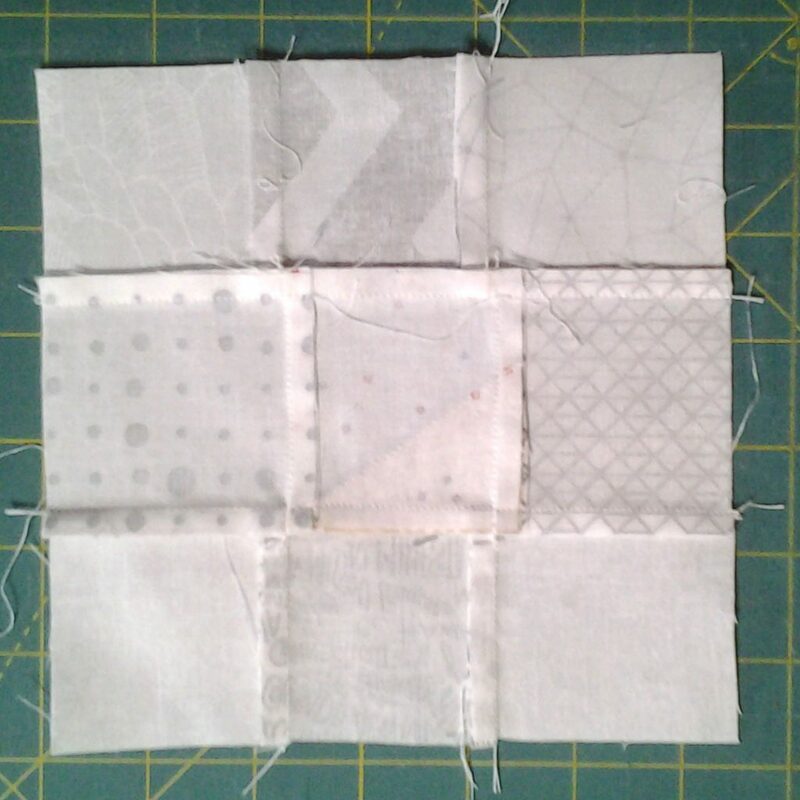 For larger blocks, try using pieced strips and cut them into various size triangles to create multiple scrapy corners. Once you get started, you’ll discover all kinds of opportunities for wonky corners. You’ll see in the Wonky Corners Quilt Block Tutorial diagrams below that I do not trim the seams when I add wonky corners. 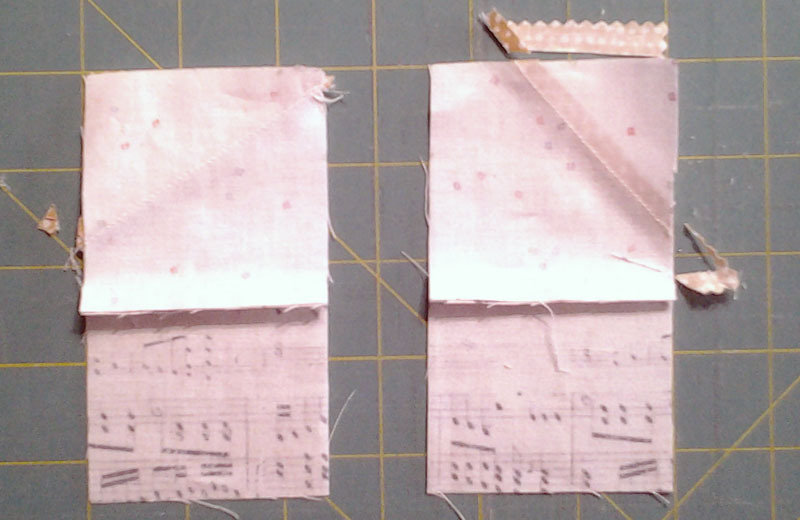 Since I usually cut the corner pieces from scrap fabrics, they are often cut on the bias. Seams sewn on the bias tend to stretch and threads are susceptible to breaking. I definitely recommend this process for small corners. Don’t trim the seam, just sew and fold the corner over the block. Both layers of fabric will be sewn into the seam when the blocks are joined. This adds stability to small pieces that would otherwise be cut on the bias. You may certainly tack or baste the corners in place if preferred. 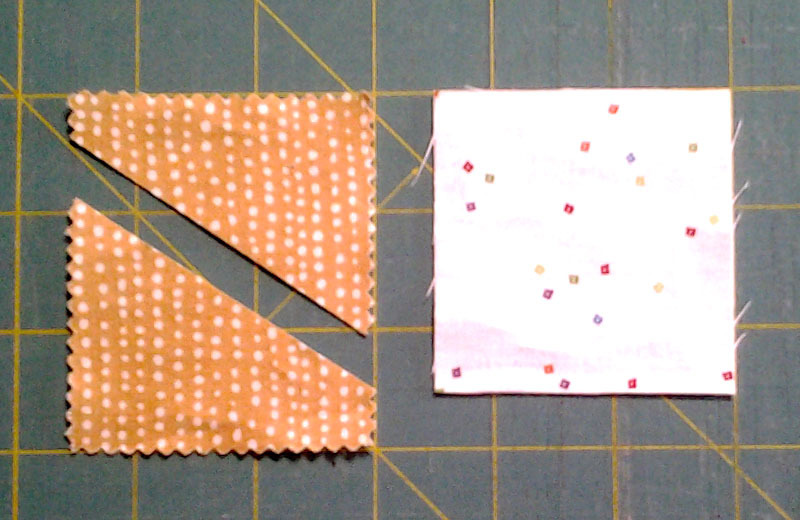 Cut the 2 ½” contrasting square diagonally from side to side just below the opposite corners. If this square is cut corner to corner, then it will cover each corner equally. To get the wonky corners, the diagonal cut must not be an equal triangle. Once cut, each piece will lay at a slightly different angle which results in the wonky corners we’re looking for. With the low volume square right side up, lay one contrasting corner face down on top of the low volume square. Adjust the corner to allow for adequate seam allowance. The photo above shows the corner triangle being too short on one side. Adjust the angle slightly so the triangle covers the corner. 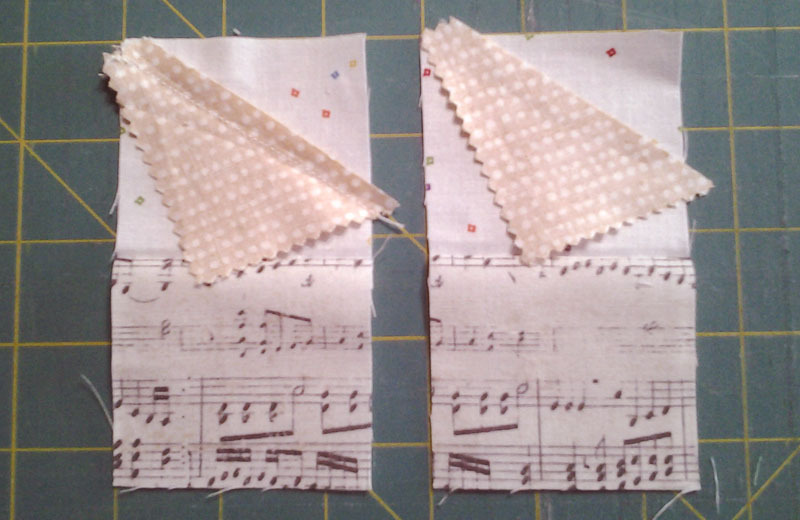 If you want two wonky corners in your block, sew the second triangle onto a second square in the same manner. Vary the angle of the corner triangles as much as possible so they won’t be exactly the same. This will keep your wonky corners offset throughout your quilt top. 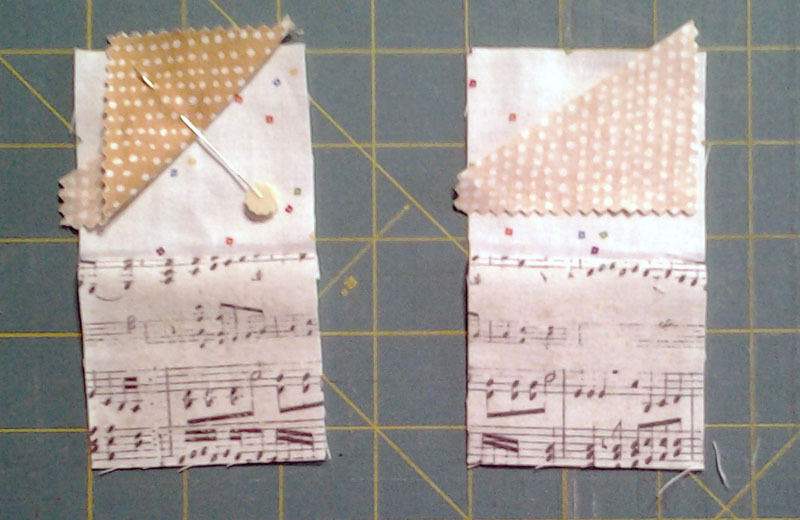 Here are two wonky corners at slightly different angles on opposite sides of the fabric square. Since these corners are small, it’s not necessary to trim the backing square. 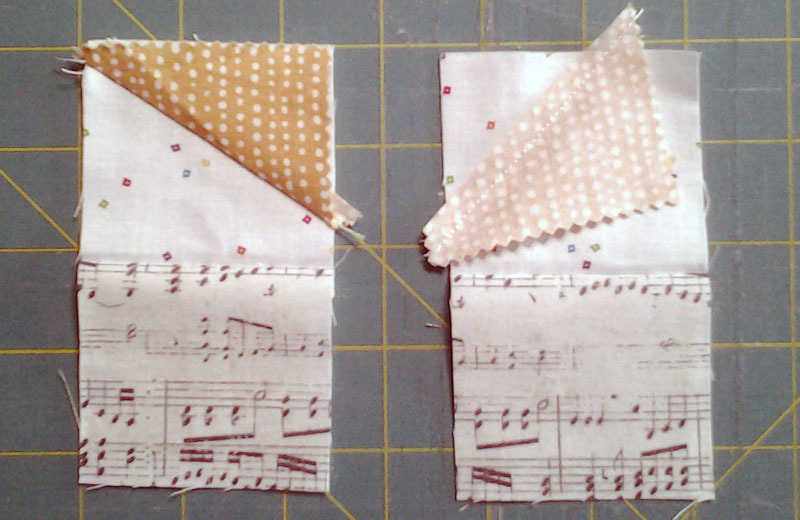 Instead, turn the sewn piece over and trim the triangle to the same size as the square. The base fabric square will provide support to the small corner sewn on the bias. Otherwise it may stretch out of alignment while sewing your blocks together. Turn squares over and trim the corner edges even with the block. Sew the 9-patch together placing your wonky corner where you’d like. Add multiple wonky corners to your block, mixing placement and colors. Then when the blocks are assembled together, you’ll have random wonky corners across your quilt top. 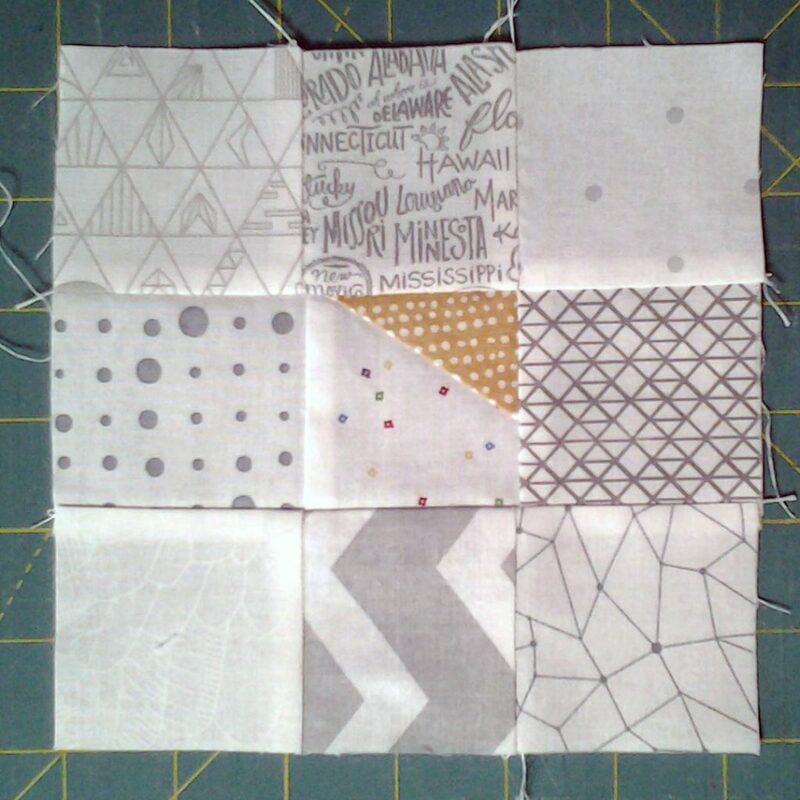 Apply what you’ve learned from this Wonky Corner Quilt Block Tutorial to modify any block pattern with corners. Have fun with color, contrast, monochromatic themes and changing up any pattern.